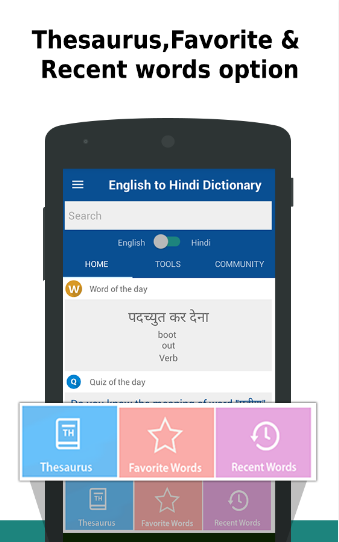 English to Hindi Dictionary is learning Android Application, designed to facilitate the Hindi speaking users who are keen to learn the meanings of English words in easy and interactive way. This dictionary can be used in two modes, one is English to Hindi, and another is Hindi to English that can be switched through easy tapping via arrow present on main home screen. • Home: which allows the users to opt from their desirable language to translate and search its meanings, be in English to Hindi or Hindi to English. • This dictionary also allows the antonyms to the selected English words. 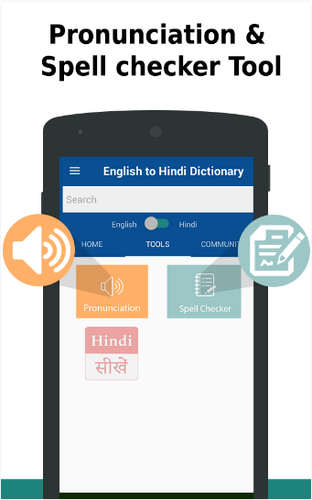 • The Ace feature of the App is its Hindi Keyboard, which helps the user to type Hindi word quite easily when the user opt English to Hindi mode in Dictionary. • Spell Check is included. 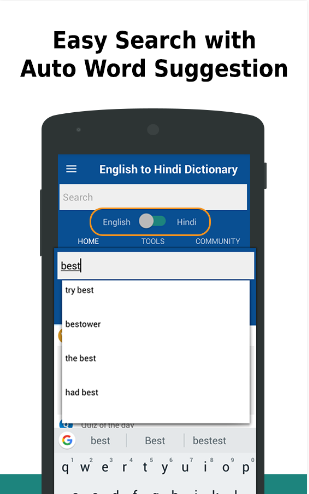 Download this free of cost learning Utility and get your hands on the smartest Dictionary towards learning English with interactive features and easy to use modes.